I’m definitely a chocolate girl. So when given the opportunity, I’m probably going to add more chocolate than necessary to my recipes. (Sorry, I’ve warned you in advance). 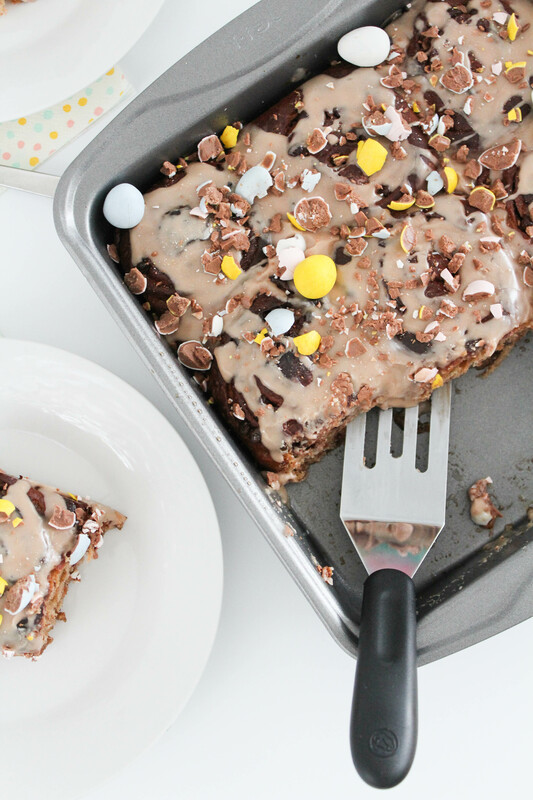 But if you’re like me, these chocolate Easter cinnamon rolls are going to be right up your alley! In a large bowl, mix your flour, sugar, salt, and the yeast. Don’t prep the yeast before, just add the dry yeast to your bowl, straight out of the package. Mix well and set aside. In a large measuring cup (or bowl with a spout) add your milk, water, and butter together. Microwave until the butter is melted and the mixture is hot. Stir the liquid ingredients into the dry mixture. Add the egg. Mix well. Add additional flour to your dough (1/3 or 1/2 cup), until you have a soft dough that pulls away from the sides of your bowl and has an elastic consistency. Lightly flour a counter or another flat surface. Knead the dough for about 4 or 5 minutes and then place into a lightly greased bowl. Allow the dough to sit for 10-15 minutes. While the dough is resting, begin making your filling. In a small bowl, mix your sugar, brown sugar, and cinnamon together. Set aside. In a microwave safe container, melt your butter. Once your dough has rested, roll it out into a rectangle (about 14×8). Brush your melted butter onto the top of your dough and spread the sugar and cinnamon mixture over the top, completely covering the dough. 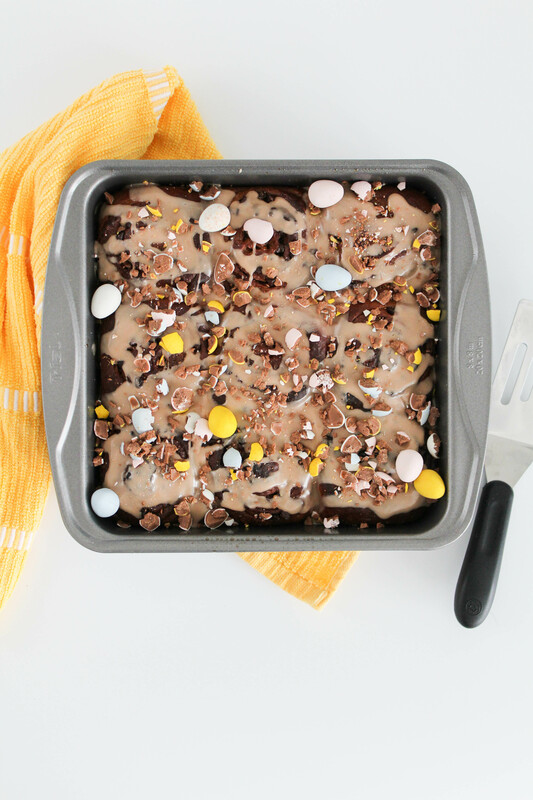 Sprinkle the mini chocolate chips over the sugar mixture. Roll up the dough tightly and cut into 9-12 even pieces. (The number will depend on the size of your finished dough rectangle). 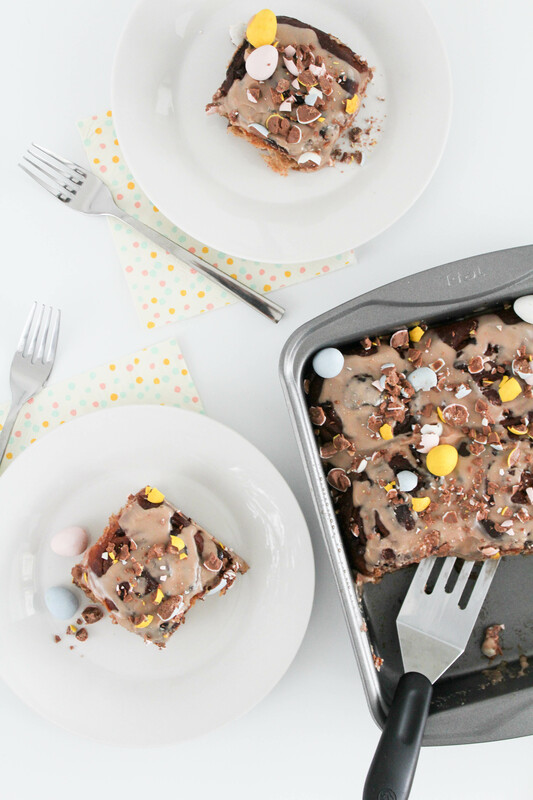 Place the pieces into a round, rectangle, or square pan, depending on the amount of pieces you have. Leave a little bit of space in between each roll, as they will increase in size after they rise! Once the rolls have risen, bake them uncovered in a 375 degree oven for 10 minutes. Remove the pan, re-cover with aluminum foil and bake for another 15 minutes. 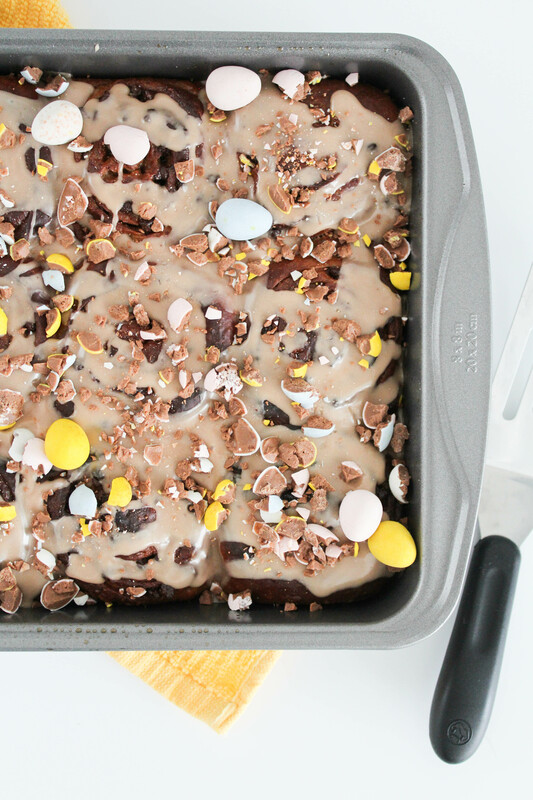 While your rolls are baking, begin smashing your Cadbury mini eggs. (TIP: You can smash them using the back of a large spoon on top of a cutting board!) Set aside. Once your rolls have baked, begin making your glaze. 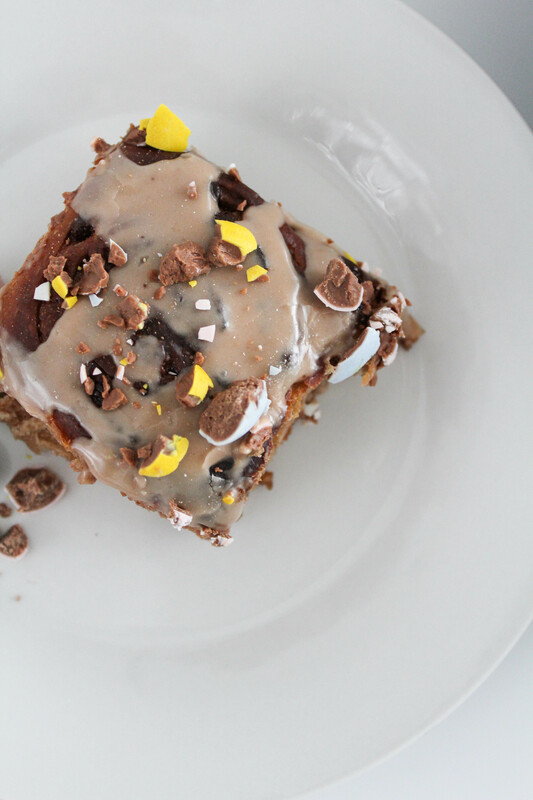 Combine the powdered sugar, vanilla extract, milk, and cocoa powder in a bow and mix well. Pour the glaze over the top of your finished warm cinnamon rolls and top with the crushed Cadbury mini eggs. I also like to add a few full sized eggs on top too. All that’s left to do is enjoy these babies! 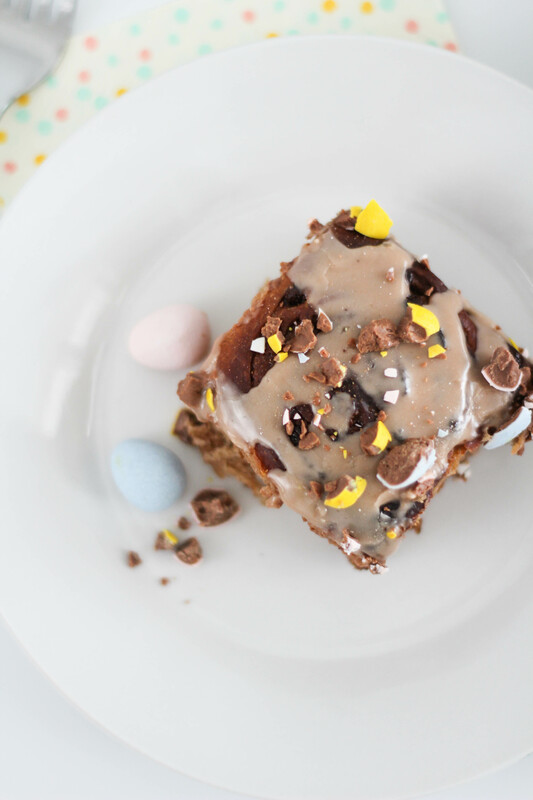 You can make the excuse that you want to “make them for the kids” for Easter morning, but I think we can all agree that these chocolate Easter cinnamon rolls aren’t just limited to the kids table… 😉 Your secret’s safe with me. These would also be a great treat to drop off at a neighbors house or bring over for a family brunch. They’d also make the perfect breakfast if you need to use up all of that candy after the 50% off sale the day after Easter. I know I’m not the only one that hits the store for that reason!